Figure 1 Eph receptor structure and cytoplasmic interactions. The intracellular part of Eph receptors consists of a juxtamembrane region, tyrosine kinase domain, SAM domain (of unknown function), and a PDZ binding site. Upon engagement with ephrins attached to the cell surface, Eph receptors dimerize, perhaps form oligomeric complexes, and autophosphorylate at several tyrosine residues (orange circles). Signaling effectors containing SH2 domains (SFKs, Abl/Arg, RasGAP, Nck) are recruited to these phosphotyrosines. Other effectors bind to the kinase domain (ephexin) or to the PDZ target site (Grip). Again, other effectors may interact with Ephs in an indirect manner (additional interactors are described in references , , and ). Cellular functions mediated by Eph forward signaling include regulation of actin dynamics and suppression of neurite extension, block of proliferation and integrin mediated adhesion, promotion of spine formation, and neuronal long-term plasticity (see text for details). region, and autophosphorylation of juxtamembrane tyrosine residues not only creates docking sites for phosphotyrosine binding proteins but also releases autoinhibition . 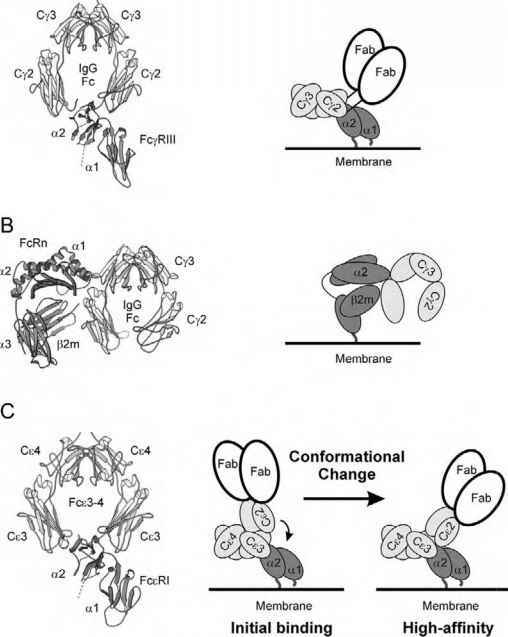 Among the first proteins to be identified as Eph effectors were Src family kinases (SFKs), which bind to juxtamembrane phosphotyrosine residues via their SH2 domains (Fig. 1) . Although SFKs mediate mitogenic effects in many cellular contexts, as downstream effectors of Ephs they are more likely to regulate cytoskeletal changes. Activated forms of Src kinases have been implicated in the phosphorylation of various cellular proteins, such as paxillin, Fak, and tensin, which are associated with integrin-harboring focal adhesions and with proteins such as p120 and P-catenin found in cadherin-containing adherens junctions . Recently, the EphB2 receptor was shown to interact and to form clusters with the A-methyl-d-aspartate (NMDA) subtype of glutamate receptors at excitatory synapses in primary neurons . Stimulation with soluble ephrinB-Fc triggered EphB forward signaling through SFKs and caused tyrosine phosphorylation of NMDA receptors. The latter process required SFK activation, as shown by the usage of SFK inhibitors . Functionally, EphB2 protein, but not EphB2 kinase activity, was required for protein-synthesis-dependent, long-lasting changes in neuronal plasticity in the hippocampus  . Plasticity defects in ephB2 null mutant mice correlated with defects in performance for learning paradigms requiring an intact hippocampus. Whether or not the interaction of EphB2 with NMDA receptors and the activation of SFKs account entirely for the observed defects remains to be investigated. 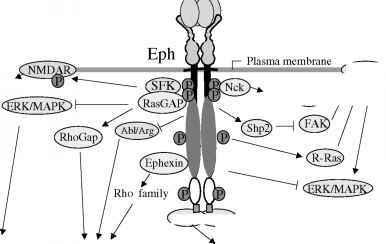 The Abelson cytoplasmic tyrosine kinase (Abl) and the Abl-related gene product (Arg) also bind EphB2 and EphA4 receptors via phosphotyrosine-dependent and -independent interactions . Unlike SFKs, Abl and Arg kinase activities are decreased by activated Ephs. Abl kinase is thought to promote neurite growth, whereas Eph forward signaling leads to localized growth-cone collapse and to repulsive guidance of growing axons. Inhibition of Abl kinase may be one of the mechanisms by which Ephs prevent local axonal growth.